The neighborhood of Northeast Carmel in vibrant Carmel-the-Sea offers walking distance to the majority of downtown businesses, shopping, and dining. Majestic oaks canopy the streets that wind and twist along charming homes, giving way to unexpected pops of ocean views. The Northeast neighborhood is bordered by Ocean Avenue to the south, Serra to the north, Serra Avenue to the north, Junipero to the west and Monterey Street to the east. Among the most famous homes located in northeast Carmel are the Hansel & Gretel House located on Torres Street between 5th and 6th Avenue. 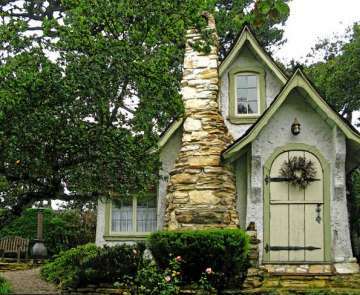 Builder Hugh Comstock built these unique, fairy-tale style homes one of which was used entirely to store his wife, Mayotta’s handmade “Otsy-Totsy” rag dolls. The famed Forge in the Forest house is located at Junipero Ave between 5th and 6th Avenue. John Catlin, Carmel’s first blacksmith and stone carver lived in the home and beautifully enhanced its gardens with stone carvings. Francis Whitaker, Carmel’s second blacksmith, added to the charm with several wrought iron pieces in the interior. Following in the legacy, the current owners which purchased the property in 1990, have made the addition of several other architectural jewels. There is the Forest Cottage, a gazebo, and Elf Cottage and the famous Door House. The Door House was actually constructed in 1906 from 304 doors that were salvaged from the great San Francisco quake. You will find two parks to enjoy in Northeast Carmel as well. Forest Hill Park, which is located off Pico Avenue, provides a children’s play area, shuffleboard court, horseshoe pits and tennis courts. Devendorf Park is located at Ocean Ave & Junipero Street and is a wonderful spot for picnics, relaxing on the grass and to hold community events. Devendorf Park is one of the rare public places in Carmel-by-the-Sea where dogs are not allowed. Families with children will love taking advantage of the great resources for kids located in the Northeast neighborhood, the Youth Center as well as the Park Branch Library. The Carmel Youth Center is located at the SW corner of 4th Ave and Torres Street. The center provides entertainment, including the Blueray Cinema and recreation activities for the youth of Carmel. It is also available for private birthday parties and dances. Administered by a private board of Directors who lease the building from the city, the Youth Center is also equipped to provide shelter for residents during emergencies. The Park Branch library known at the “Children’s Library” located at 6th Avenue at Mission provides many children’s services as well as housing the city’s historic archives. In addition, the local Fire Station is situated at 6th Avenue between Mission and San Carols streets. Built in 1937 of Carmel Stone, it still stands today and protects Carmel-by-the-Sea. Click here to preview all Carmel homes for sale in the Northeast neighborhood. For all available Carmel real estate, click here. 22 homes sold in this neighborhood in 2018. The most expensive home sold for 2.040 million and was a 3 bedroom, 2 bathroom Mediterranean home with 1,722 SqFt of living space on a 4,000 SqFt lot. The least expensive home sold for 850K for a 2 bedroom, 1 bathroom, Carmel cottage. 40 homes in this neighborhood sold in 2017. The most expensive home sold for 2.1 million for a 3 bedroom, 2.5 bathroom Cape Cod style home with 1,650 SqFt of living space on a 8,000 SqFt lot. The least expensive home sold for 700K and was a 2 bedroom, bathroom, “contractor’s special” with 850 SqFt of living space on a 4,000 SqFt lot. In 2016 28 homes sold in this neighborhood. The most expensive home sold for 2.050 million for a 3 bedroom, 3 bathroom, 1,924 SqFt home on a 3,290 SqFt lot. the least expensive home sold for 520K for a 2 bedroom, 1 bathroom, 771 SqFt fixer on a 3,290 SqFt lot. 34 homes in this neighborhood sold in 2015. The most expensive home sold for 3.35 million for a newly crafted, 4 bedroom, 3.5 bathroom, 2,970 SqFt home on a 8,000 SqFt lot. The least expensive home sold for 595K for a 1 bedroom, 1 bathroom, 451 SqFt carmel cottage fixer on a 3,750 Sqft lot. In 2014 36 homes sold in this neighborhood. The most expensive home sold in Northeast Carmel sold for 3.59 million and was a 3,337 SqFt, 4 bedroom, 4.5 bathroom home, situated on 12,000 SqFt of land. The least expensive home sold for 598,500 for a 2 bedroom, 2 bathroom 1,065 SqFt, bank-owned fixer on a 4,000 SqFt lot. In 2012, 39 homes sold in this neighborhood. The most expensive home sold for 2.1 million and was a 3 bedroom, 2 bathroom home with 1,667 SqFt of living space, situated on a 4,000 SqFt lot. The least expensive home sold in the neighborhood was a “55 and over” townhome with 1 bedroom and 1 bathroom that sold for 300K. For a detailed analysis of Carmel real estate sales, check out our monthly Community Market Reports. To live in Northeast Carmel is to be part of a special and dynamic community. Your convenient access allows you the wonderful ability to enjoy all the area has to offer from sports and recreation, dining and entertainment to community involvement. Enjoy the storybook charms of Carmel-by-the-Sea or take a quick drive into Pebble Beach to experience world class golf, and the resort luxuries of Pebble Beach Lodge or the Inn at Spanish Bay. Your home provides a perfect locale to explore the wonders of the Monterey Peninsula including those out your front door, from Carmel Beach to the dozens of hiking trails along the coast. Your desirable location possesses unparalleled beauty and character and a perfect place to call home for years to come.